I just moved in to a new house about two months ago and I couldn’t love it more! Except that all the walls are some variation of cream or tan.It’s not that I don’t appreciate the coziness of it, I’m just not a tan walls kind of girl. However I’m having an even harder time figuring out exactly what I do want all my walls to look like.We own now, so I can pretty much do whatever I want! 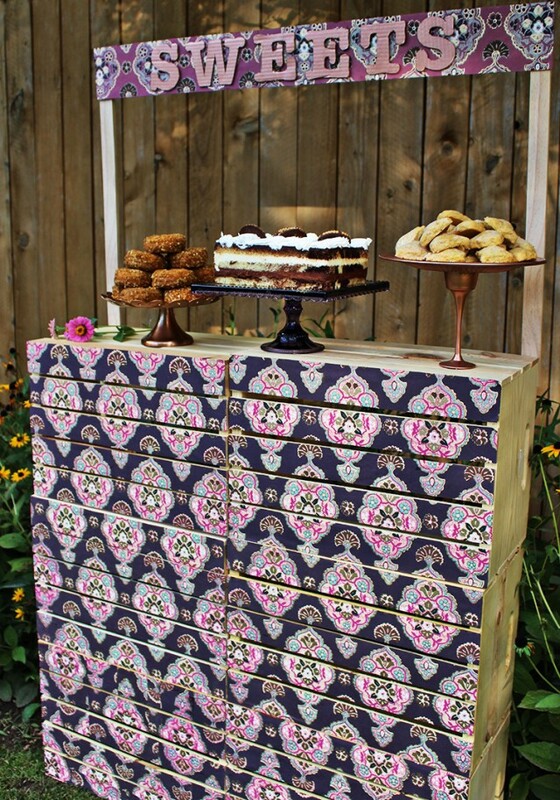 Wallpaper, paint, stenciling, permanent accents, ahh there are just so many options! And with all the other rooms I am more excited to work on first I know it’s going to be a while before my entryway gets the makeover I want (whatever that is..). In the meantime we really needed some coat hooks. 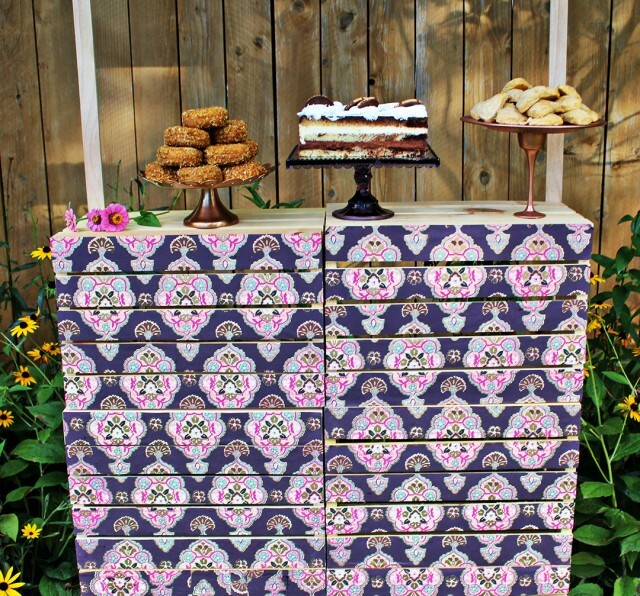 I hate coats being tossed on tables, chairs, doors and, inevitably, floors so this was a must-do project. 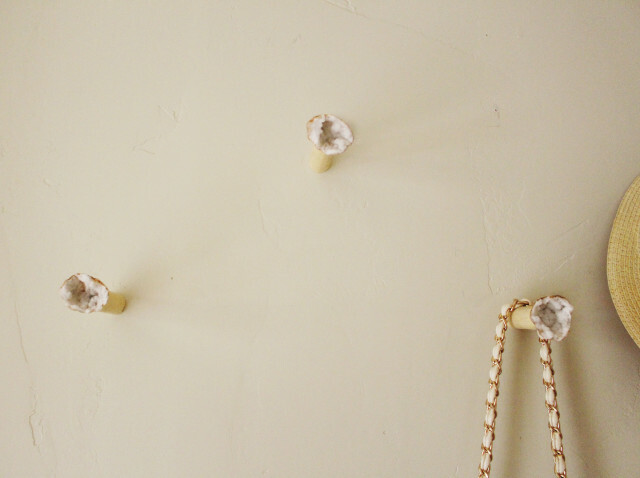 I decided to make some simple wood hooks with a gem accent and I chose to just go with the ivory flow and feature some soft-colored geodes. 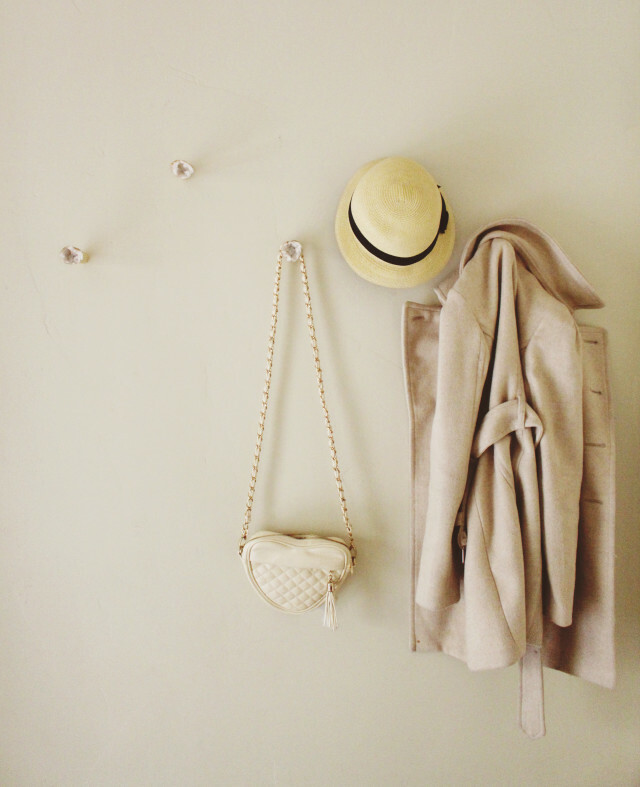 If I’m going to have to live with tan walls, I love the cohesive monochromatic look. Any gem would be beautiful on the tip of these though (imagine some pyrite or amethyst!) 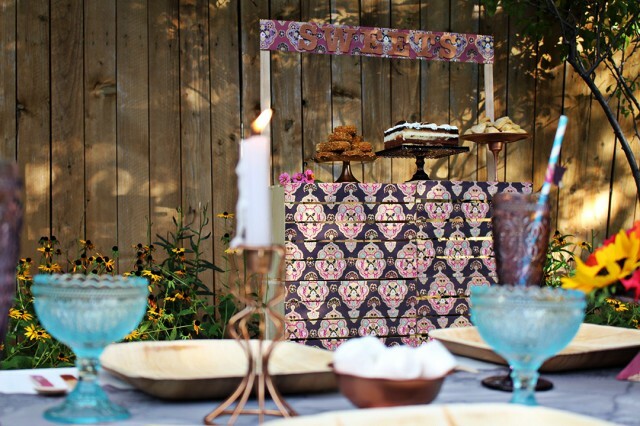 and I love the look of the glamorous stone mixed with the raw wood. I’m finally getting around to posting our November contribution to Drifter + the Gypsy! Lighting is something I could always use more of! I used to think that making a lamp would be difficult but once I tried it, it turns out it is super easy. 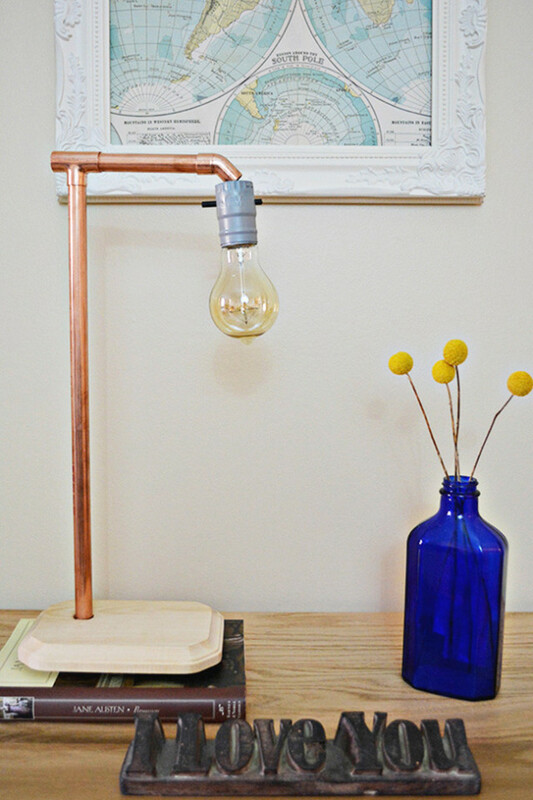 Especially if you use a lamp kit, but if you are feeling adventurous you can just buy an extension cord and a socket. And of course I think copper is gorgeous–who doesn’t? 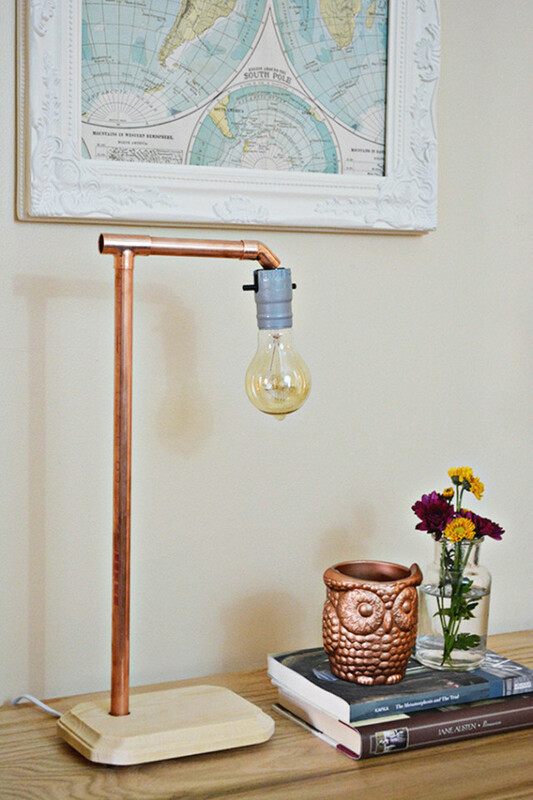 So choosing copper for my first foray into the DIY lamp world was a perfect choice. 1. Drill a hole in the corner of the wood plaque. Once the hole is drilled, you may need to trim around the edges a little bit to make sure the copper pipe will fit through. To do this, just take the drill bit and move it in a circular motion. 2. 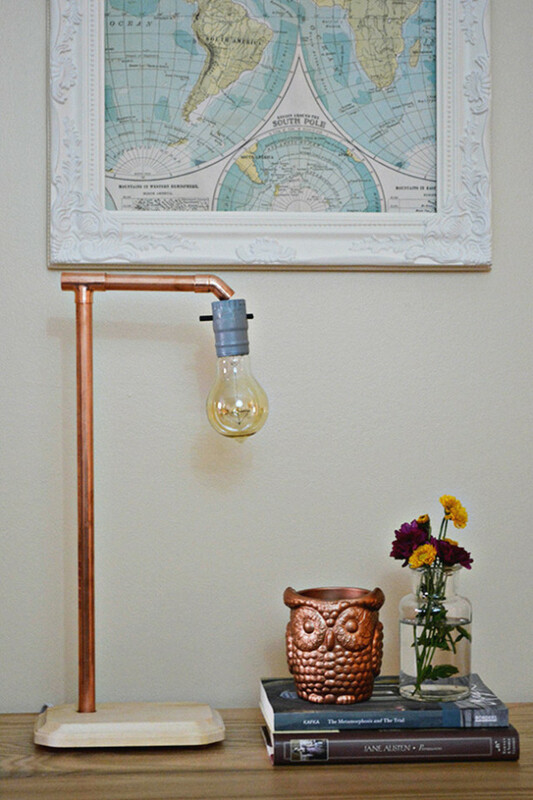 Measure and mark 16 inches on the copper pipe. 3. Use the pipe cutter to cut the pipe. 4. Take the pressure tee and place on top of one end of the pipe. 5. Next, measure 4 inches on the pipe and use the pipe cutter to cut. 6. Connect that piece to the pressure tee. 7. Connect the 45 degree elbow. It will look like the photo when all connected together. 8. Add a dab of super glue to the hole you drilled. This is just to ensure that the pipe is well secured. 9. Place the end of the pipe into the hole and hold it for about a minute. 10. Now we will wire the lamp. Start by taking end of the wire up through the bottom of the wood plaque. 11. Wiggle the wire all the up through your pipe structure. It may be easier to temporarily deconstruct the structure, which I did. 12. Pull the end of the wire out through the top of the elbow. 13. Place 4 bumpers on the bottom corners of the wood. 14. Take the socket in the lamp kit and use a screwdriver to loosen the screws. 15. Next, attach the wires to the screws. You will want to take the ribbed wire and wrap it clockwise around the silver screw. Repeat with the other wire on the bronze screw. Make sure that the cord is not plugged in! 16. Place the socket cover on top of the socket. 18. 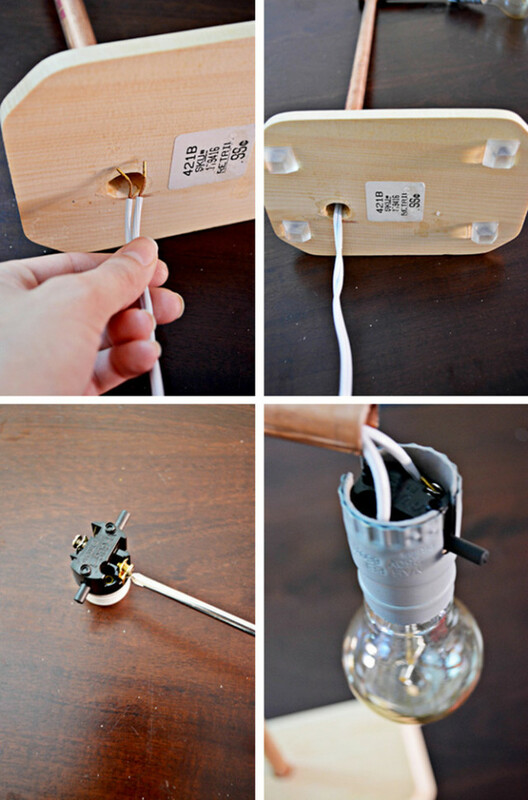 Plug in your new lamp! I hope you enjoy this little lamp project. 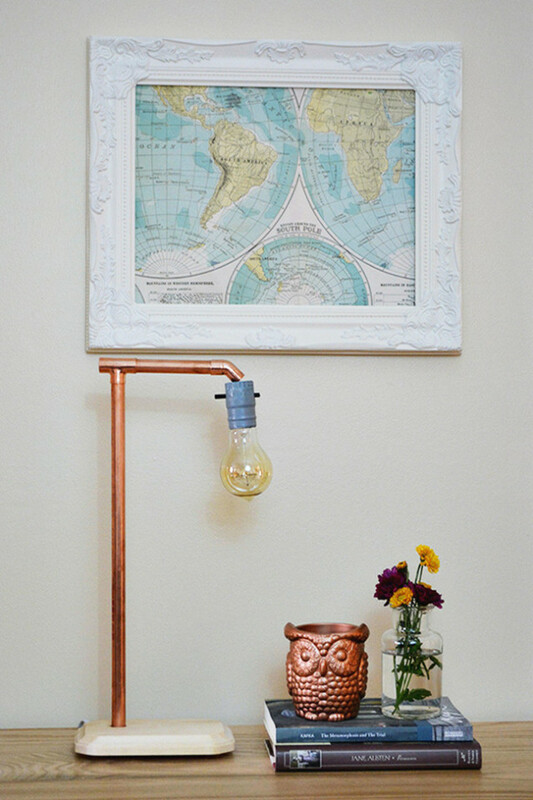 Think of all the fun possibilities with copper piping or other materials! I ended up spray painting the socket cover gray since I didn’t love how the bronze looked with the copper but think of how fun a bright color would be–say a turquoise! 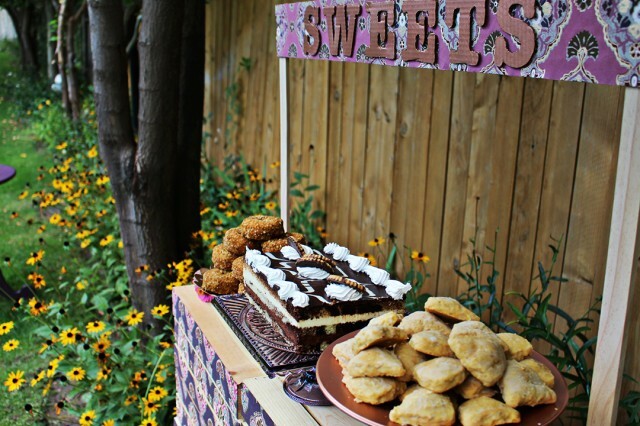 I’m obsessed with this treat table. 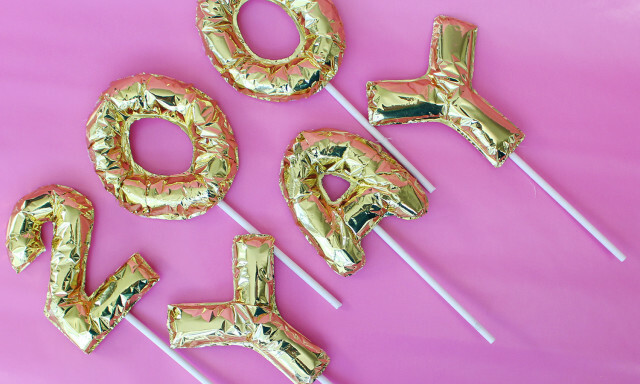 It was DIY but it was so so easy! 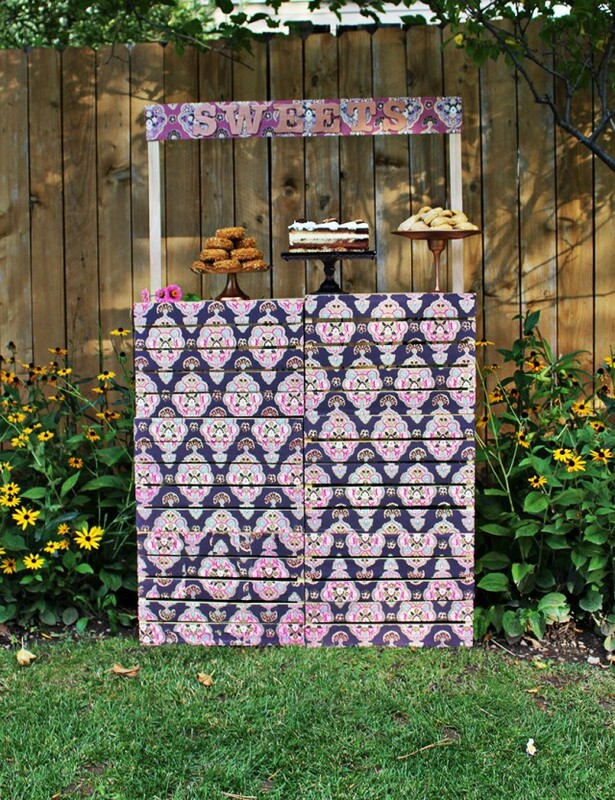 We saw this adorable lemonade stand and thought the same concept could be used to create a more sophisticated look and boy am I glad we did, I LOVE how it turned out! Decoupaging with any paper you like is fun but, trust me, decoupaging with World Market’s handmade papers is fun fun. That stuff not only comes in a million stunning designs but its so lusciously thick, it goes right not without bubbling or ruining the papers appearance in any way. It is definitely my recommended medium for decoupaging. Ok, with that said, roll out your chosen paper, place your wood crate atop it (I bought my wood crates at Michael’s and used and 50% off coupon on every one so they ended up about $7.50 each) and trace a line under the first wood slat. You can choose to simply trace all the lines now but if you want the look of a continued pattern like mine then you’ll have to painstakingly trace, cut a strip and place the paper back under your crate to do it for all the other slats. But I really think the end result is worth it. 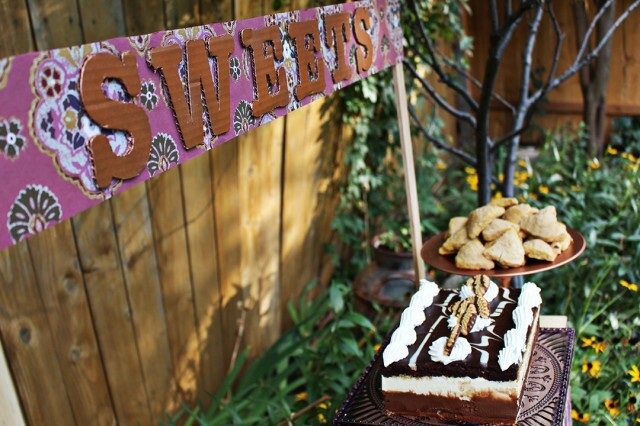 After all strips are cut, apply Mod Podge liberally and then smooth your paper strips on. Repeat with all crates. 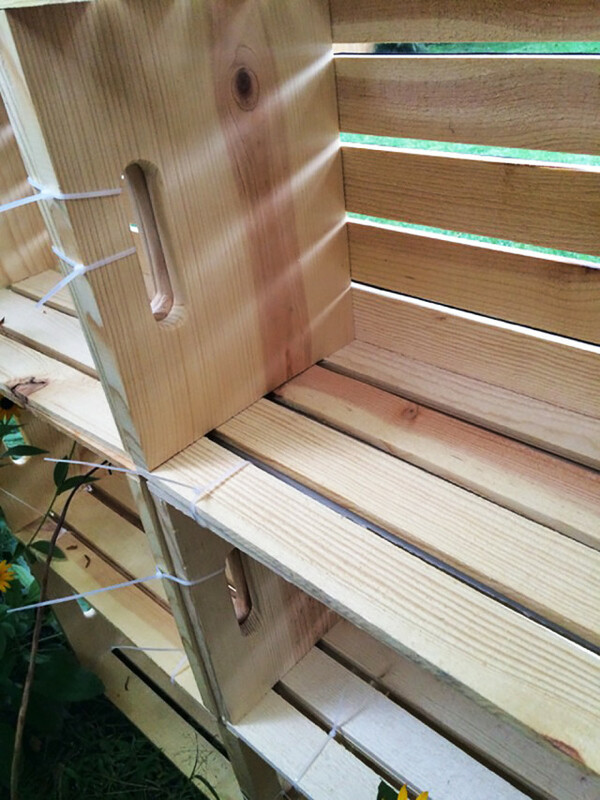 When you’re ready to assemble, stack the crates a top one another in two columns and then use your zip ties to latch them firmly together through the slats and the handles. 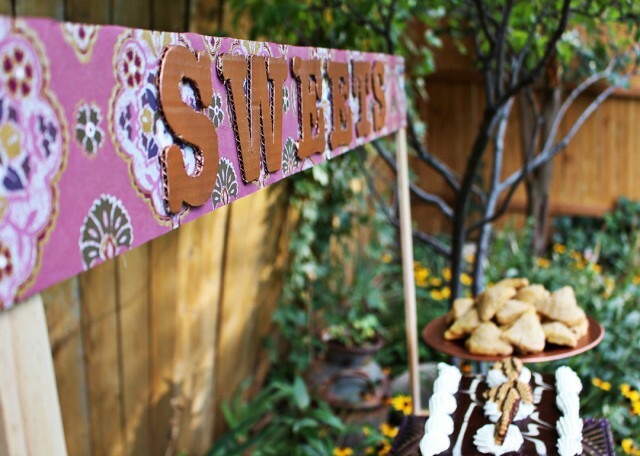 To make a sign for your table, cover a long piece of lightweight craft wood (or cardboard) with your paper using the steps given above. 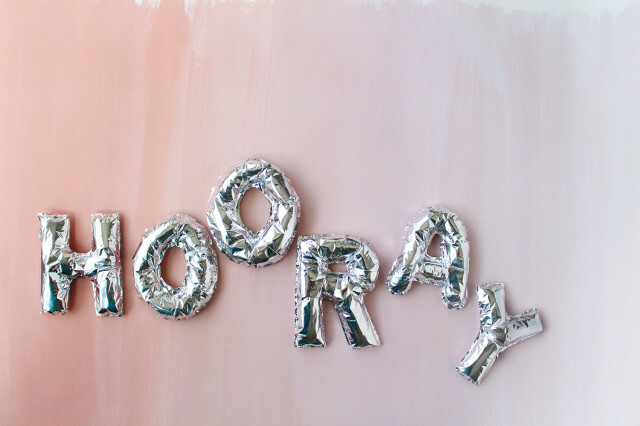 Cut letters out of cardboard and then paint them a matching color. Use hot glue to attach to the board. 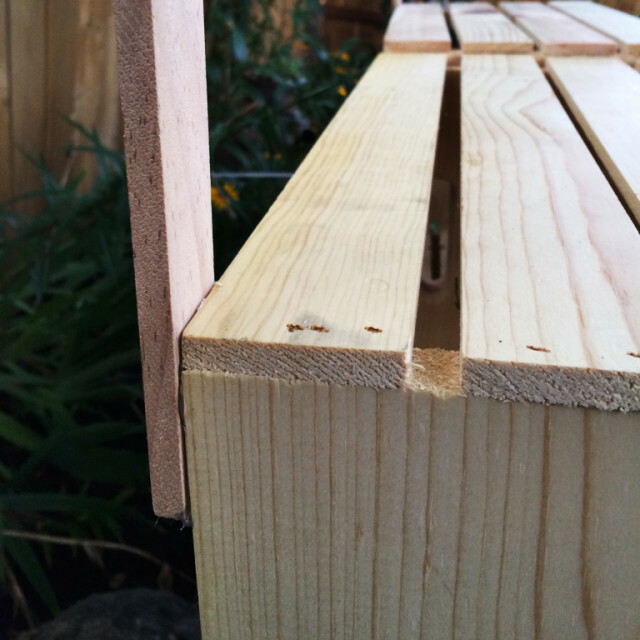 Glue the board to your wood stakes and then adhere your wood stakes to the back edge of the top crates. 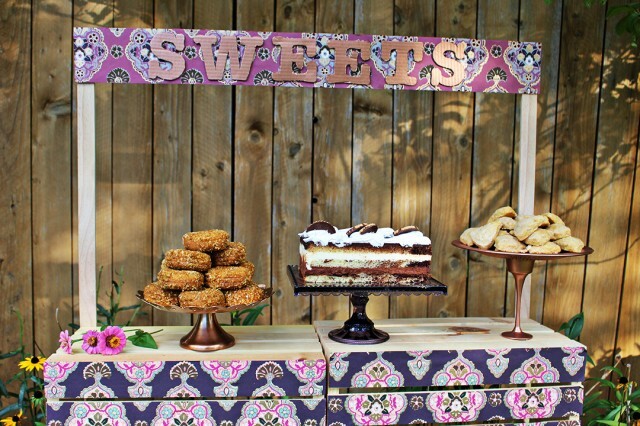 What I love about this table is that since it’s made from crates, you can not only use them to transport your supplies to your party site but you can also store your sweets in them during your party for easy refilling! 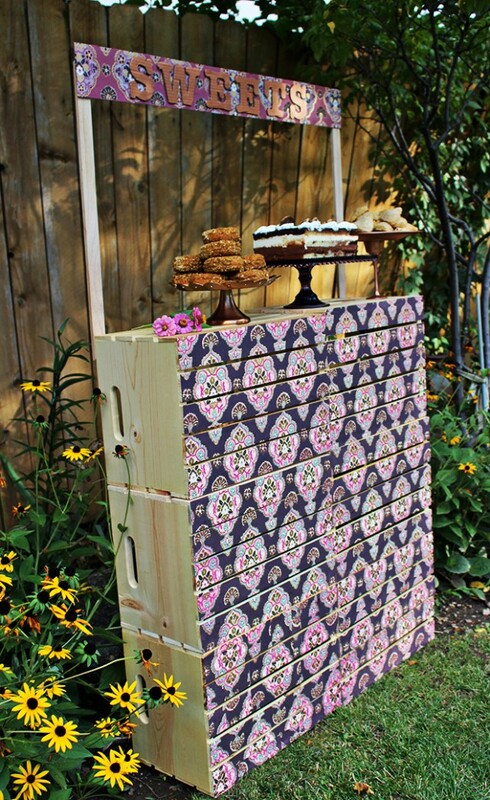 And then at the end, the table comes easily apart so it fits through any doorway and in any car. There really is no loosing with this display stand.